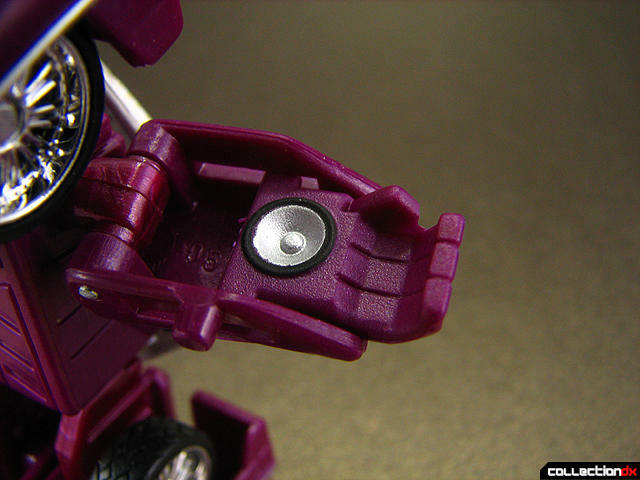 Ginrai's review of Herr Fiend inspired me to make a similar review, yet concerning a toyline you probably never heard of. The question is, was this act of ignorance on your side a curse or a blessing? I'm afraid not the latter. Let's dive in and witness this creature with our own eyes. But first, some introduction. We all know that Maisto is one of the biggest Europe-based car replica company that competes directly with Bburago, the market's big fish. 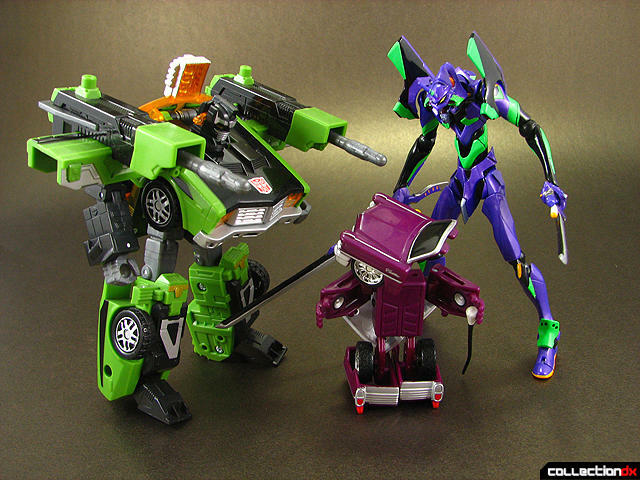 Unfortunately for us, they also had an idea to mimic Hasbro's all-successful Transformers line, that is very popular on the Old Continent (even in Poland it's the bestselling boy-oriented toyline). This way, RoboRods and Cycones were created. Boy, how fun these creeps were! 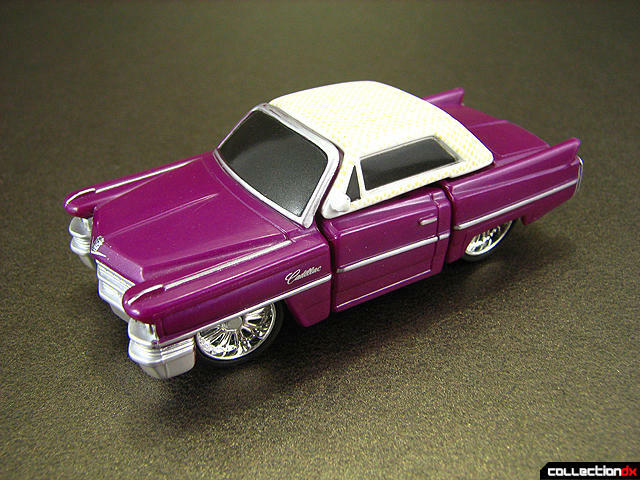 Let's examine the fine example of the first one, Cadillac Coope Deville '63! Just to justify my attitude and sense of this article, I bought this toy at my local bookstore as an experiment. I thought, what will it hurt me to spend 5 dollars...now I know. And knowing is half the battle. 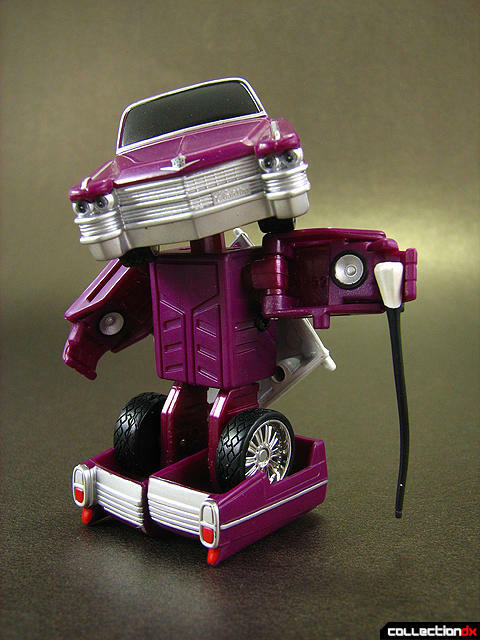 So, this our hero in his car mode. Honestly, that's what attracted me to this toy in the first place when I saw him inside his blister card. 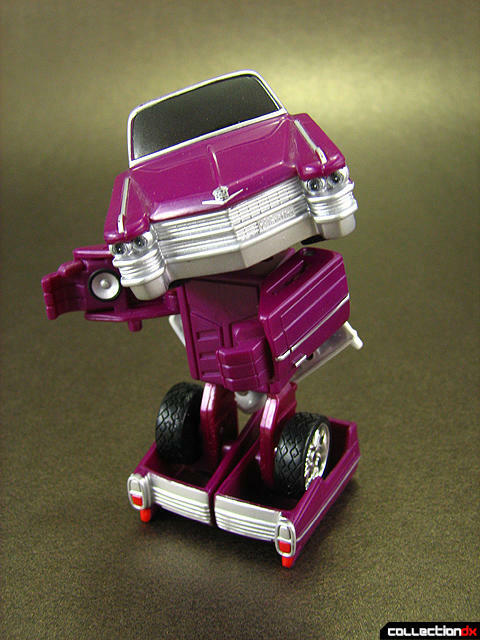 This really could have been a very decent vehicle mode... but there is one flaw in this design. As you can see, integrity issues are present and the lines of divided parts are awfully visible. Also, part alignment seems to be somewhat out of control. A big shame, it makes a nice looking cadillac an ugly one. The front is very nice, though. The grill is well-sculpted and the tiny Cadillac sign is a small gem. Back- nice paint apps, terrible black canyon in the middle. 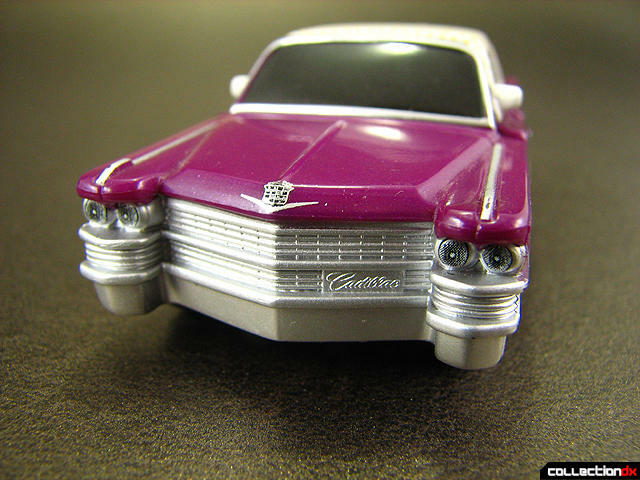 The rear Cadillac logo looks almost like a v-fin of a Gundam that's just been vertically cut in two with a beam saber. What's interesting, the roof is covered with a light-beige pattern that instantly makes you think of a collapsible leather roof. Leather roof? Chromed wheels? 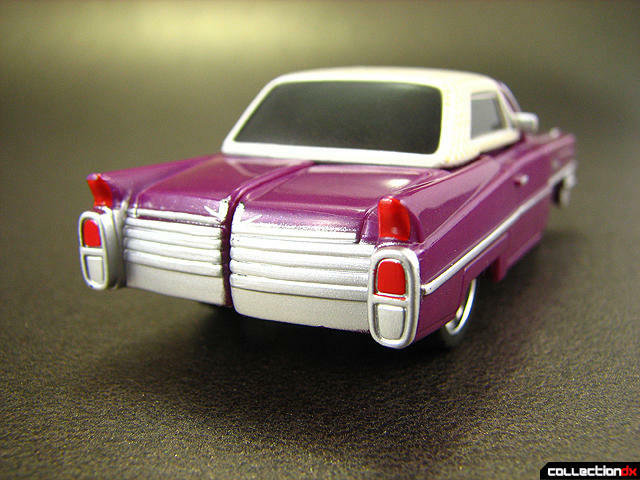 Violet paint job? 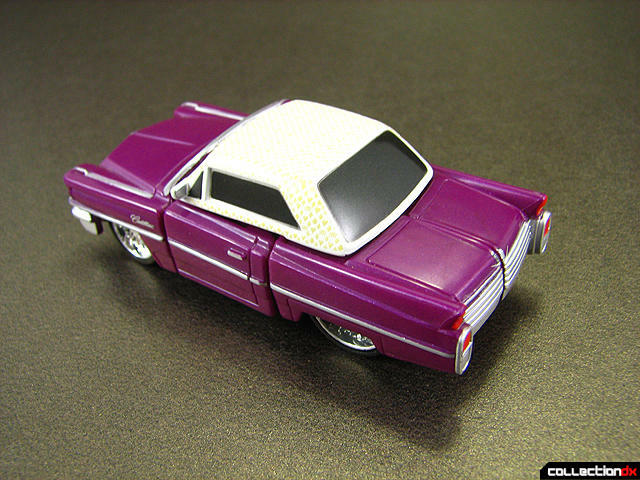 Is it just me, or is this stylized to look like a pimp mobile? Not that I have something against it, it just occurred to me. Now, let's have a quick look on the undercarriage before we transform this thing. ... ok, that's very... promising? Eh, let's just proceed. BY THE POWER OF MAISTO! I'VE GOT A LEATHER ROOF, BABE! The tranformation is quick, I'll give the toy that. 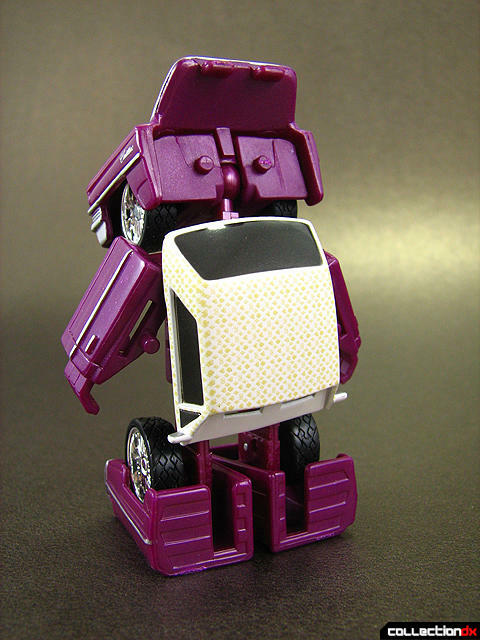 But its result is what a TF toy expert with 10 years of experience can only call an abomination. What the hell is this supposed to be? It's humanoid for sure, but that's one ugly, disfigured humanoid! And it has proportions of a Smurf! Must be one of Brainy's failed experiments. Really, this looks bad and after just a glimpse one can tell the designers didn't give this mode too much thought. "Hey, Alex, the brass told us to turn this Cadillac replica into a humanoid robot. How shall we make it look like?" "What do I care, I already got my paycheck for this month, just make it cheap". I remind you, 5 dollars. The back is maybe not SO bad, but there's not much there to begin with. One thing that bothers me, though, is the roof. Technically, it's supposed to be turned 180 degrees like here, but usually it's unachievable, as the roof is loose like hell and for most of the time it will hang down diagonally. This is the first time I managed to set it up properly. Yep, definitely a Smurf turned into a Tranformer by Gargamel. Note the incredible head that consists simply of the entire front of the car. Because creatively designed humanoid heads are so boring. Is this monstrum equipped with any poseability? Surprisingly, yes, the arms and head are on ball joints. Aaand that's it. So you can imagine the range of the articulation is pretty weak even compared to modern Mini-Cons and there's not much you can do with this robot. Ok, there is one thing I do like about this mode, hands, to be precise. While the fingers aren't that great, the speakers mounted on the palms are a sweet touch which almost looks like a sonic weapon interpretation of Iron Man's hand blasters. And guess what? We've got an accesory here. A PVC cane that slides on the hands from below... dear God, I was right! This really is a pimp-bot! I wonder how could you use that as a melee weapon. Face me if you dare, evil fiend! Umm, excuse me, would you be kind enough to get up from the floor and stop laughing already? Final thoughts. This could be a really nice Hot Wheels-like car, but unfortunately, it transforms. 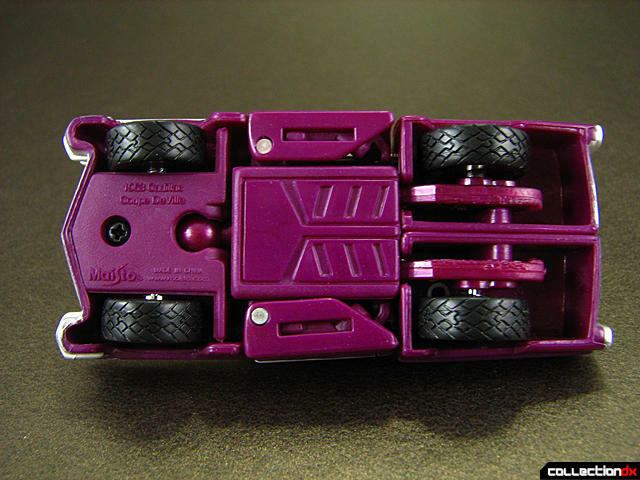 This way, the vehicle mode loses almost all of it's power and looks not-so-great due to the bad part alignment and all of the resulting black gaps. Robot mode is a mistake. Strange proportions, no thought given to the design, weak poseability and an overall ugliness gives us a terrible toy. Maisto screwed up really bad and no sane collector should ever even try to buy this. It's not worth it. I'd probably got rid of mine, but I know too well no one is stupid enough to purchase this from me. This could be a pretty good size comparison, but I think it's more of a preparing for a fast execution. Love this. Excellent work, and my favorite kind of bot: obscure and awful. The cane is a genius touch. 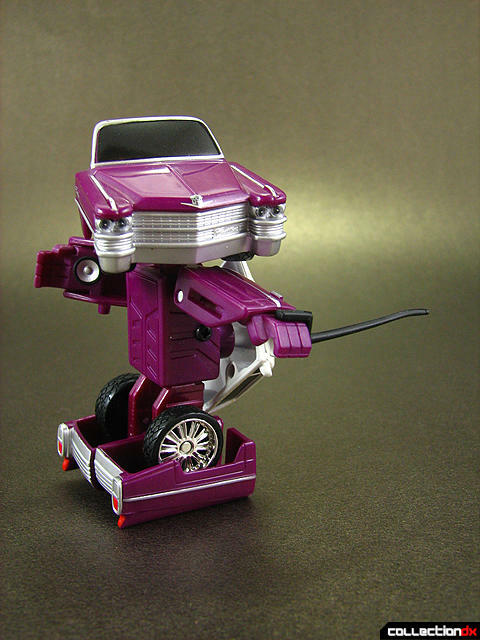 I've seen a few of these on ebay, and they never show the robot mode. Now I know why. Aww, that's awesome! I want one of those too! 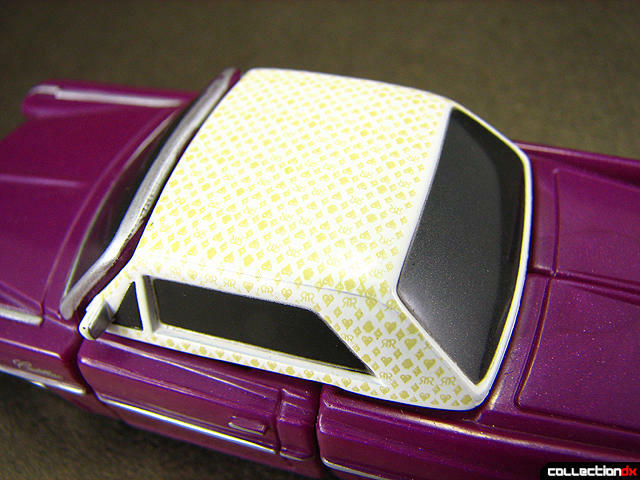 I had the Scion tC version, it came with an oversized set of headphones. Same exact transformation. I thought, coming form Miasto that they would be metal. 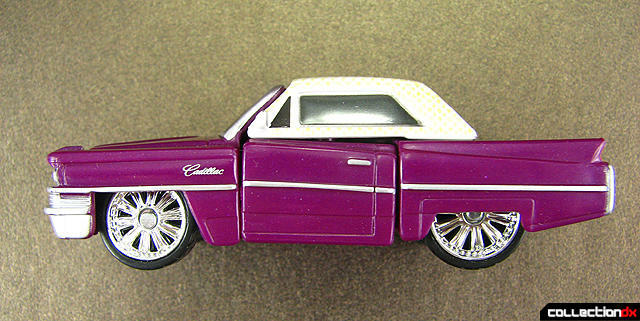 I've got to give Maisto credit for baseing this on the 63' Caddy...Which reminds me, I wish Hasbro/Takara (even Bandai) would look into baseing their bots on older cars...1955-57' Chevys, Auburn Boattail Speedsters, Nash Metropolitans, Rat Rods, Hot Rod T-buckets and 32'/34' high/lowboy Fords. Tons of underused potential there. This thing looks cool as hell. I've got one of the Cykons. I daresay it's not a bad toy. Part tolerances are better, transformation actually looks like a robot(save for the bike front for the face)and so on. No way, I'm not even planning to buy them, I've had enough with this one already and I'm rather surspised some of you guys like it :P Ih well, maybe I'm too deep into standard humanoid aesthetics. Next what I want to review is either a Revoltch, a Microman or one of my Transformers (kind of preparing for G1 color MP Starscream, but I can't get myself to resize all of his pictures again). 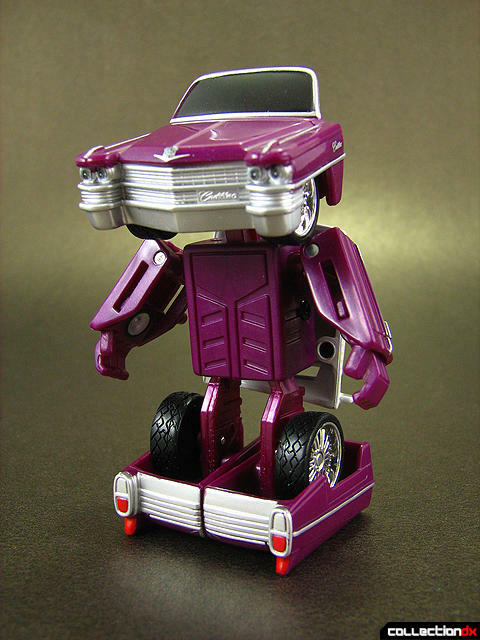 I tend to think of this as an SD bot, since it's proportions are a bit off. ;) Besides, some cars do genuinely have faces on them (like the 2009 Camaro). But, yeah- I genuinely like this toy. And, there are more of them, with different alt modes? Yes, five more at least, all with different alt modes, but with exactly the same transformation. Check my E-Review on YT to see the box, there are others shown on it. you've found one of the most unusual easter egg gems that I've ever witnessed. You are indeed an interesting gentleman for obscure but delightful tastes sir. All I can think of is lyrics from the rap song, "Big Pimpin" Big Pimpin, spending the cheese, I be Big Pimpin on B-L-A-Dees! I dig it. And I can see some potential custom work, here. 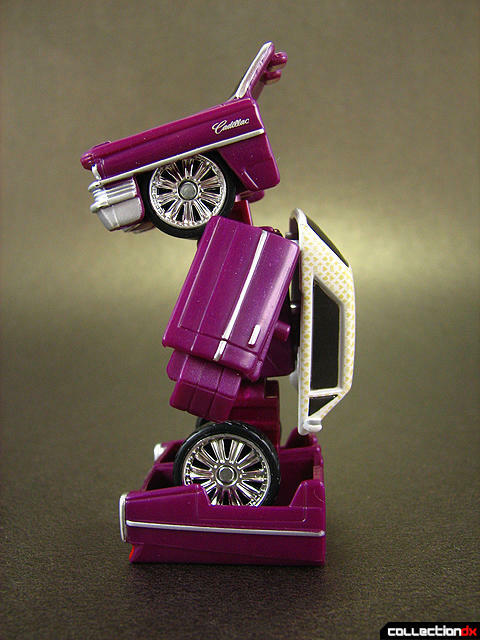 I mean if they can do stuff to g1 ironhide and Ratchet, why not this?